THE SCOOP: Want real American shrimp? Ranch Foods Direct makes it easy to support American fishermen and buy high quality American seafood. The store continues to offer a great winter special on beautiful wild-caught U.S. shrimp priced at $12.99 per pound. The supplier is Richard Gollott, a Mississippi shrimp processor who serves on the board of directors for the American Shrimp Processors Association. The multi-generational Gollotts are hailed as one of the seafood industry’s founding families, possessing a long and colorful history on the Mississippi Gulf coast. “My grandfather started in the business, and he had five sons who all went into the business, and their sons all got into it. We’ve now got it whittled down to where there are two siblings remaining in the business,” Richard says. The family started out processing and selling oysters and crabs, and, over the course of four generations, wound up in the shrimp business that continues today. REAL DEAL: Ranch Foods Direct partner restaurants have a chance to showcase genuine U.S. Gulf shrimp on local menus. 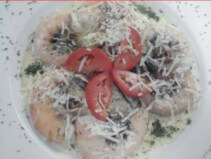 Just one example is shrimp from Ranch Foods Direct, beautifully prepared and presented by the Tabequache Steakhouse in Woodland Park. Why settle for less?